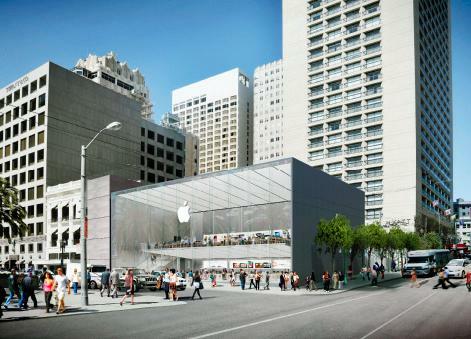 Apple has submitted plans for a new retail location in San Francisco's Union Square that would replace the Apple Store currently at Stockton and Ellis. Plans for the new store emerged on Thursday, according to SFGate. The rendering of the retail space shows a gray, box-shaped store with a facade that appears composed almost entirely of glass. Both floors of the store are visible from the front of the building. The new space would be located at the corner of Stockton and Post, in a spot previously located by Levi's. It would be 45 percent larger than Apple's current Stockton and Ellis location, with all of the same features. San Francisco officials are working with Apple on plans for the new location, which could bring an additional 50 jobs to the area, in addition to the 350 that the current location supports. Officials are hoping to find more "green measures" and "energy efficiencies" for what they hope will become the "Bay Area hub" for Apple shopping and customer service inquiries. Apple currently has three retail locations in San Francisco, not including the company's Best Buy-based mini stores. The One Stockton Street location that would be replaced by this newest design has been in operation for nine years. The move from One Stockton Street would be in keeping with previous statements from Apple CEO Tim Cook. Asked about the health of Apple's retail operations, Cook explained that some stores are too popular for the amount of space they have available. Over the course of 2013, Apple will be renovating or moving 20 of its retail stores into larger spaces in order to accommodate their traffic levels. Apple will also add 30 new stores this year, largely outside of the United States.